Quickly and easily transfer your files between OTG-enabled Android™ smartphones and tablets(1) and PC and Mac computers. 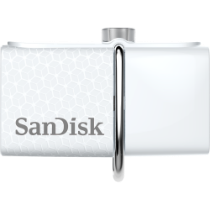 The SanDisk Ultra Dual USB Drive 3.0 makes it easy—and fast—to free up space for photos, videos, songs, and more. Offering 16, 32, 64, 128 or 256GB(2) of storage, SanDisk Ultra Dual USB Drive 3.0 gives you more than enough capacity for large digital photo or music libraries and plenty of room to move yesterday’s videos off your phone so you have room to capture what’s happening today.